dressed up like a lady: Caught in the act (of whining). Caught in the act (of whining). 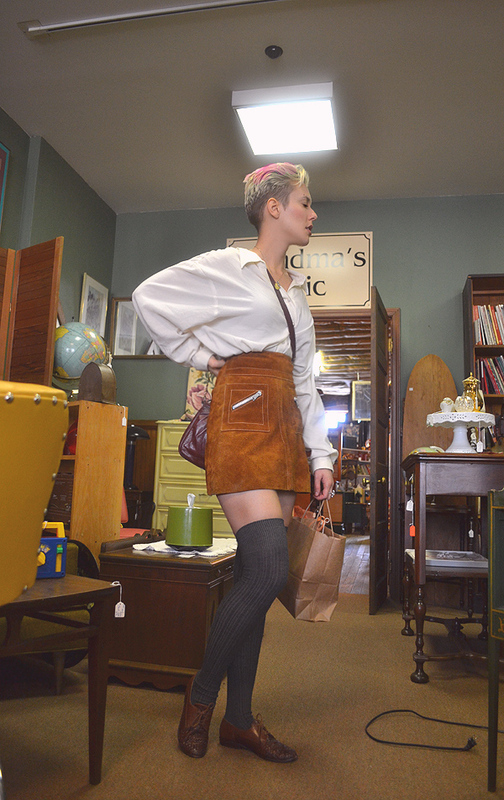 I'm not super proud of this, but the only full outfit shot I ended up getting of this ensemble was taken by MC while I was bitching about my back hurting at an antique store. This probably isn't the most appropriate way to pay tribute to my over-the-knee inspiration, the gorgeous and fearless Jane Birkin, but it's all I've got until I nab a Paris apartment with a baby grand. I love this outfit. I love over the knee socks too. I love seeing them on other girls but feel like I'm dressing like a 'naughty schoolgirl' when I try to wear them myself. great outfit... and that pose doesn't look bad. Dang, I wish I had the balls to wear girly over the knee socks. Bonnie & Clyde. Jus' saying.